Trump did best in the states with the lowest percentages of foreign-born residents. “I love the poorly-educated”, gushed Donald Trump after winning the Nevada primary in February. But in the end, what happened in the primary, stayed in the primary. Come November, Trump lost the state to Hillary Clinton, a turn that is explained by the fact that there is a higher percentage of foreign-born residents in Nevada than in any state won by Trump, save Florida. If the size of the Trump vote can be used as a proxy for a state’s sentiment towards immigration and concern about terrorism, and it probably can, then it seems that the people who are most worried about immigration and terrorism are those who are the least exposed to it and the least at risk from it. This is counterintuitive from the point of view of probability: why worry about a low probability event? But it could make sense from the point of view of fear: many people can be prone to fear and to misunderstand what they do not know well. Their opinions of others are formed mainly by what they see or read in the media, rather than by their own first-hand experiences. In the United States overall, there were in 2015 as many as 42 million people who were born in another country, or 13.2% of the US population. But as shown in the chart, every state won by Trump last November, except for Arizona, Texas and Florida, has a smaller percentage of foreign-born than the national average. 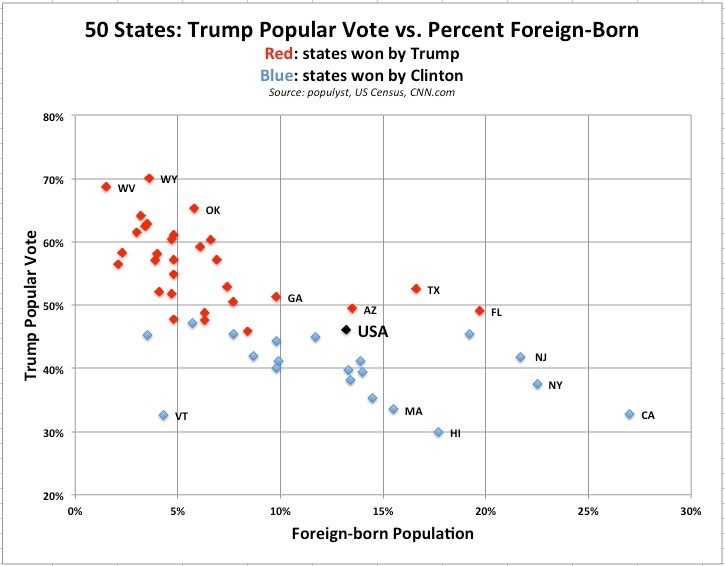 In fact, the lower the percentage of foreign-born in a given state, the better Trump has done in that state. In Wyoming and West Virginia (3.6% and 1.5% foreign-born), he carried approximately 70% of the popular vote. But in Georgia (9.8% foreign-born), he carried about 50%. This difference in the vote cannot be totally attributed to the fact that a majority of the foreign-born probably went for Clinton, given that the difference between 70% and 50% is far higher than the difference between 9.8% and 3.6% and that the latter variable includes non-voters such as children and undocumented immigrants. Meanwhile California, New York, New Jersey, Nevada, Hawaii and Massachusetts all have a higher percentage of foreign-born than the national average and they all voted for Hillary Clinton by wide margins. With Illinois, the District of Columbia, Washington state and a few others, these are the states with the big urban centers that saw the largest protests against the recent executive order banning entry from seven Muslim countries. In the above chart, the percent of foreign-born (provided by the US Census) includes unauthorized migrants. 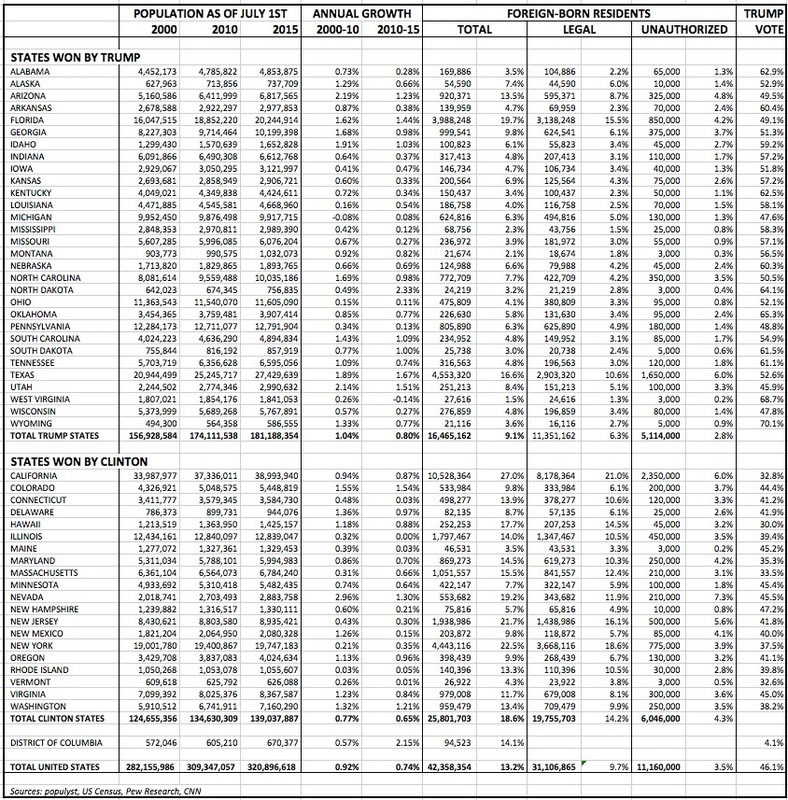 Pew Hispanic Research estimated their numbers in every state as of 2014. If we strip the unauthorized figure from the foreign-born figure, we end up with an even better correlation. 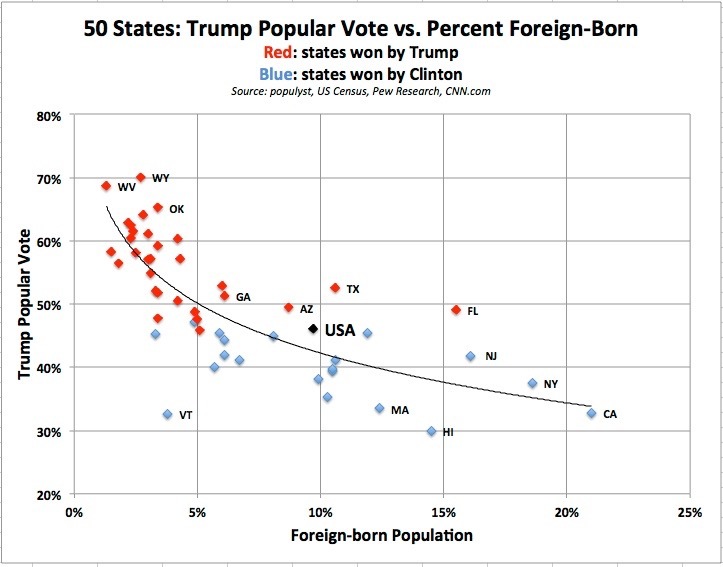 The resulting chart below reinforces the notion that Trump did well in inverse proportion to the foreign-born presence in any state. Texas and Florida are moderate outliers in the sense that Trump did better than one would have expected from the regression. But conversely, he did far worse in the New England states, in particular Vermont, New Hampshire and Maine all of which have fewer than 5% foreign-born in their populations. Vermont is a big outlier, ostensibly because of the number of former New Yorkers living in the state, or the Bernie Sanders factor. Its total population is also very small at around 630,000. With his current policies, the President is not courting any immigrant-heavy states and his solid base elsewhere allows him to ignore the protests. People who live in the rural South or Midwest may feel just as strongly in favor of the visa ban or of other Trump initiatives but their low-density living makes it harder for them to make their numbers visible through outdoor protests. The same is true of the lower density regions of Arizona, Florida and Texas where support for Trump was rock solid. It is also worth noting that the Trump states (red in the chart) have not been the targets of terrorist activities or threats to the same extent as New York or Washington DC. So here again, the people more often targeted by terrorism seem less worried about newcomers and Muslims than people who live in a small town or rural setting where the odds of terror attacks are close to nil. Terrorists want to inflict as much damage and as many casualties as possible, a more attainable goal in dense urban centers. Even if they targeted smaller localities, the odds that it would be one’s own small town out of thousands of others are probably no greater than the odds of a mass shooting by a citizen born and raised in the United States. Meanwhile, there is only one New York City and only a few cities of the size of Chicago or Washington DC. Even in these cities, the odds of being a victim of terrorism are very small. An attack may well occur but the likelihood that it will be at the exact time T and place P where a resident R may find himself, out of hundreds of millions of other possible daily T-P-R combinations, is indeed minimal. Of course, a scenario involving a WMD attack throws off this tragic and otherwise reassuring calculus. But then this speaks more to the need for detection and prevention of WMDs, rather than to the extreme vetting of individuals originating from certain countries. So to sum up, people who have few if any foreign neighbors appear to be more worried about foreigners and terrorism than people who have many foreign neighbors. And from their sparsely populated townships, they could now effect restrictive policies not only for their own localities, but even for the large cities that they rarely visit. This is not so unusual. Historically, decisions made at the center have not always complied with local preferences. However, it should be added that historically, it was more often the preferences of the big cities that were imposed on the great plains. President Trump says he loves the poorly-educated but he also relies on the support of voters who are less exposed to immigrants. Which then begs the following question: how deep is these voters’ sentiment towards the foreign-born in places where they are scarce, and for how long can the President tap it to maintain his popularity? A lot hinges on the answer. Pew Research: 20 metro areas are home to six-in-ten unauthorized immigrants in US. The Economist: What Brexit and Donald Trump have in common.